Have you been seeing 777 everywhere lately? Are you wondering "Why do I keep seeing 777" or what kind of hidden message has this number? You've come to the right place; keep reading and you'll find out why are you seeing 777 angel number and what is the real meaning of 777! Angels rarely communicate with us, but when they do, it's often because they have something really important to tell us. Whether they want to advise us, help us, or warn us of something, most of the time they use numbers to deliver their divine messages. Therefore, repetitive 3-digit number patterns, such as 111 or 777, are never a simple coincidence. These numbers are actually messages from the Universe and our guardian angels who want to capture our attention because something wonderful is about to happen in our life. When it comes to the significance of 777, if you're seeing this number often, it simply means that you're headed in the right direction in life. The angel meaning behind the number 777 is reassurance that you're moving on a path towards something bigger and better. This is a very positive number, so one 777 angel meaning is that these numbers are actually a confirmation telling you that you're in tune with your inner self and in tune with the Universe. At the time you're seeing the number 777, you may notice that your health or your finances improve, or maybe that your relationships with other people got better. You just need to remember that you're exactly where you're supposed to be and you're being supported by your guardian angels, so trust the process and enjoy the journey. 777 also has a special meaning in the Bible. The number 777 meaning in Bible is that this number is the closest one to God. 777 is a divine and perfect number for many reasons: in the Book of Revelation, there are seven churches that had seven stars and these stars symbolize the seven guidance angels. Some people also believe that 777 in the Bible represents the threefold perfection of the Holy Trinity. Also, another association of the number 7 with God is that according to the Bible, God created the Universe for six days and rested on the seventh day (Sabbath). When it comes to love, 777 is a sign that good things are about to happen in your love life. Your guardian angels are reminding you to have faith and be open to receive love. For those who are already in a relationship, the angel number 777 can signify growth and expansion, which might mean that you're going to have children or expand your family. Even though this number is considered to be a highly positive and lucky number for everyone who sees it often, 777 can also bring you bad luck, but only if you have bad thoughts. One of the 777 meanings is to clear your mind of any negative thinking, in order to let the good and vibrant energy in. Your spirit guides want you to make a change in your outlook of life if you want some things to change for the better. There can be multiple spiritual meanings and reasons why you are seeing the number 777 everywhere. Whenever you're seeing this number, the angels send you a message that you're in alignment with your life purpose, which is the basis for success. Another spiritual meaning of 777 is that you need to keep your mind focused on your true potential and realize that you're much more than what you think. In order to do this, you need to start living in a state of awareness and be present in the moment. Be aware of yourself and everything around you, be more watchful of your actions, and pay close attention to your feelings and thoughts every day. Your increased self-awareness will guide you through your life journey and you'll be able to see things clearly and live in a state of inner peace and calmness. 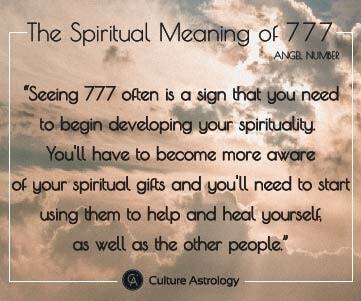 If you're seeing 777 often, then it is a sign that you need to begin developing your spirituality. You'll have to become more aware of your spiritual gifts, and you'll need to start using them to help and heal yourself as well as the other people. By helping others you're also helping your soul to rise up to a higher level of consciousness. Therefore, this number is often a confirmation that you're soon going to reap the rewards of your hard work to help people. Why is the number 777 so special? Angel number 777 is considered a lucky one, so it's often a sign that good fortune will come soon into your life. Seeing this number is proof that your life is unfolding as it should: you're right where you're supposed to be and you're making all the right moves. 777 serves also as a reminder to connect to your inner self, listen to your intuition, and appreciate all the blessings that you have in your life now. This angel number might appear to you at a point in your life when you're feeling discouraged or worried about the outcomes of your actions. So when you see this number, don't be worried or afraid - know that the Universe and your guardian angels are right there to support and encourage you to continue in the direction you're headed.